Disabled people in England and Wales are now almost three-and-half times more likely than non-disabled people to be a victim of serious violent crime, according to new research that has been described as “a wake-up call to politicians”. The new analysis of official crime figures by the charity Victim Support also shows people with a “limiting” illness or impairment are twice as likely to be victims of violent crime without injury, and 1.6 times more likely be a victim of personal theft. While violent crime has fallen by almost half for non-disabled people over the 10 years to 2015-16, over the same period the proportion of disabled people with limiting impairments who were victims of violence increased by 3.7 per cent. In 2005-06, non-disabled people were at greater risk of falling victim to violent crime than disabled people, but since 2011-12, the proportion of people with a limiting disability or illness who suffered violence has overtaken the proportion of non-disabled people. 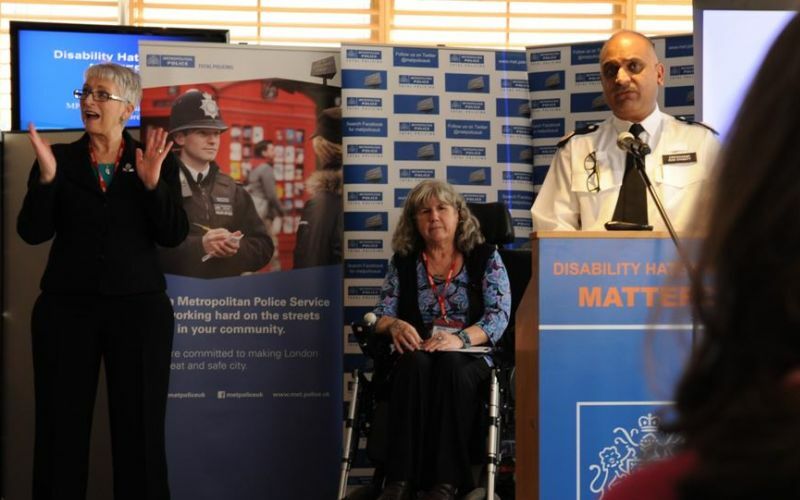 One leading disabled activist, and a coordinator of the Disability Hate Crime Network, Anne Novis (pictured), said she believed the rise in violence against disabled people was closely connected to the demonization and blaming of disabled people for the economic crisis. She said: “When a certain section of society is demonised as being the sole cause for the economic woes of a country, just like we are seeing with immigrants, then it’s like painting a bulls-eye upon us. We become the targets for all sorts of abuse, harassment and violence. She added: “It’s not always about us being deemed an easier target, or being vulnerable, it’s the perception that as such we ‘cost’ more, get more benefits, help, special cars, etc. Novis said the time when violence against disabled people was rising over the last six years – 2010-12 and from 2014 onwards – appeared to coincide with the periods when ministers were making most use of so-called “benefit scrounger rhetoric” to try to blame disabled benefit claimants for the government’s deficit. She said the research highlighted yet again the need for “perpetrator analysis” to show “what prompts and ‘gives permission’ for such acts”. Stephen Brookes, another coordinator of the network, said that ministers – including the chancellor, George Osborne – MPs and right-wing media were all responsible for such rhetoric. He said the report showed “what sadly we have known for years and many (including a lot of police forces) have tried to ignore, that disabled people are an easier target in every way”. The report, An Easy Target?, warns that the figures are likely to under-estimate the extent of violence and theft experienced by disabled people, as they were drawn from the Crime Survey for England and Wales, which does not cover institutions or group homes. It also says that the proportion of such crime that falls into the category of hate crime “is difficult to establish, largely due to low reporting rates and a lack of awareness amongst police, criminal justice professionals and even disabled people themselves as to what constitutes a hate crime”. It warns that “neither health, social care or criminal justice professionals have the expertise and solutions necessary to start addressing the risk and tackling the causes of offending against disabled people”, so more research is needed “both into the causes of the increased victimisation of disabled people and how disabled people can be better protected”. The campaigning journalist and author Katharine Quarmby, author of the ground-breaking book Scapegoat: Why We Are Failing Disabled People, which investigates disability hate crime, carried out a small survey of 100 victims of disability hate crime last year on behalf of the hate crime network. When asked why they had been targeted, many mentioned changes to disability benefits. She wrote in Scapegoat that in times of economic hardship, people look for someone to blame. Quarmby, another DHCN coordinator, said: “Sadly, at the moment in the UK, one target group is disabled people (other target groups include refugees and economic migrants). “We should learn from the lessons of history, otherwise we repeat them. Political leaders, in particular, should be very careful not to blame particular groups for economic hardship, nor penalise them at times of trouble as it allows some in society free rein to turn against them. “Sadly, the Victim Support report seems to suggest that this may be happening, right now, in the UK. “The time-frame of the significant rise in the reported violent crime against disabled people corresponds directly to a time when disability benefit cuts were being accompanied by hostile rhetoric against disabled people who were being described as ‘scroungers’ and ‘fakers’. A Home Office spokesman said: “Any violent crime is cause for concern and can have a devastating impact on the victim. “That is why our modern crime prevention strategy includes action to tackle a range of crimes – including violent crime. “We also know disability hate crime is a serious issue which affects a considerable number of disabled people and their families each year. “The UK has one of the strongest legislative frameworks in the world to protect people from hostility, violence and bigotry.